PACT® VET Wound Gel is a hydroactive colloidal gel for treating wounds, inflammations and burns. Rapid healing of the skin is assisted by an optimally moist environment. PACT® VET Wound Gel can also be used to treat larger wounds and inflamed wounds. The use of PACT® VET Wound Gel is safe and no side effects are to be expected. PACT® VET Wound Gel can be applied to skin and mucosa several times a day. If necessary, PACT® VET Wound Gel can also be applied to a plaster or dressing which is then applied to the area being treated. Wounds generally heal more rapidly if they are cleaned to remove wound discharge residues, residues of dead fibrin and other contaminating particles. 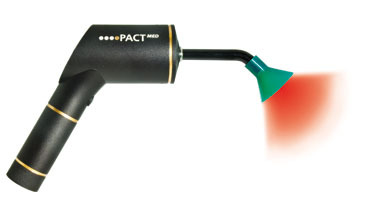 PACT® VET LED is a special LED light that has a wavelength of 625 nm. Due to its special design the light is delivered to the wound area in an optimal manner. Please do not use any other light sources because no improvement in the healing process can be expected. A combination of PACT® VET Wound Gel and PACT® VET LED brings about a reduction of pathogens on the surface being treated. If fungal infections are suspected, light treatment time can be increased to approx. 9 minutes. Treatment can be conducted several times a day, even over a lengthy period of application. Use of the larger PACT® DERMA device is limited to large animals and large areas of treatment. Prepare the wound: as required, open any abscess, irrigate the wound and apply PACT® VET Wound Gel. Allow to act for approx. 1 minute, then, depending on severity and the size of the area being treated, perform light treatment at a distance of 1 cm for 1 to 9 minutes. In case of doubt or if access is difficult, always treat with light for a longer period. The Wound Gel contains a photosensitiser, to which bacteria and fungi respond sensitively. The sensitiser is only used as a catalyst and is not consumed itself. irradiation. The destruction rate is virtually linear in relation to light treatment time. enterococci up to 4 log steps (99.99%) in 60 seconds, up to 8 log steps in 120 seconds (laboratory conditions). Longer light exposure times may be necessary, depending on accessibility and the degree of infection. destruction of Trichophyton rubum: much longer light exposure times necessary. Complete destruction (laboratory conditions and human toenails) by light treatment twice for 9.5 minutes each (maximum light treatment time setting) at a distance of at least 1 cm. feline/canine gingivitis. After the removal of dental scale, apply gel evenly to the inflamed gingiva and treat with light immediately (without allowing time to act) at the inflamed sites for at least 1 minute in each case. Treatment can, depending on the severity of the inflammation and individual response to treatment, be repeated any number of times. However, a single application is usually sufficient. One benefit of PACT® treatment is that it can be used an individual number of times until the wound heals.